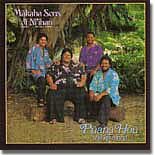 Puana Hou Me Ke Aloha was album number six for the Makaha Sons of Ni'ihau. Originally released in 1984, it is now available for the first time in CD. This album won the group it's first recognition by the recording industry, the Hawai'ian Academy of Recording Arts with awards as Traditional Hawaiian Album of the Year as well as Group of the Year. The Sons share some of their current favorite songs characterized by their rich and inventive harmonies. Here you find Kaua'i songs, like Carlos Andrade's fragile "Limahuli", "Kaua'i O Mano", from Dennis Kamakahi which is describing scenic spots on the Garden Isle, and Angie Kupau's "Waipahe'e Falls"
There are flower songs,too, such as Kaui Zuttermeister's "Na Pua Lei 'Ilima", about the 'ilima blossom and Kauakahi's own "Nani Wale Na Pua", a fragrant ballad describing the beauty of all flowers. Yes, i love it. A keeper in my personal collection.